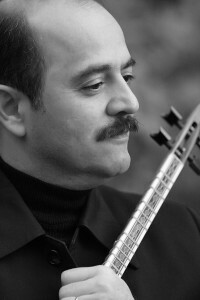 Born in 1960 in Mashad, Iran, Mr. Kayvan Saket’s musical experience began during his elementary school years while performing with the Music Workshop on national Iranian television. He received musical instruction on the “tar” from his uncle, Mr. Manoucher Zamanian, upon reaching adolescence where he showed promising signs of a future and successful musical career. He was also taught by Mr. Hamid Motabassem for a short period of time. Soon after, Mr. Saket began studying the works of classical and contemporary Iranian musicians. In 1989, Mr. Saket joined the Aref Ensemble under the leadership of Mr. Parviz Meshkatian; Saket’s collaboration with the Ensemble continued steadily into 1996; during this time period, they released several albums and performed extensively throughout Iran and abroad. Around the same time, Mr. Saket established the Vaziri Orchestra. This orchestra’s primary goal was to bring about a revival of the traditional style of Iranian master Colonel Alinaghi Vaziri. Together, Mr. Saket and the Vaziri Orchestra perform on a regular basis in Iran; their work includes pieces such as “Ey Vatan”, which is a dedication to the legacy of Mr. Vaziri. Mr. Saket has pushed the boundaries of traditional Iranian music to new and breaking grounds through his creative arrangements of well-known western classical music, using traditional Iranian instruments such as the “tar” and “setar”. These innovative works include pieces such as Mozart’s colorful Symphony No. 40 and Brahms’ Hungarian Rhapsodies (for a complete list of pieces and publications, please see under Books & CDs).